The Who Will Care? Awards 2019 are an opportunity to pay tribute to those who have made an outstanding impact on their community and improved the lives of others. 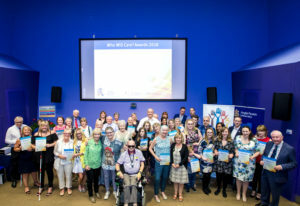 This year’s award ceremony will be held on the evening of Wednesday 22th May 2019 at Anglia Ruskin University in Chelmsford. Who Will Care? began in 2013 when five independent commissioners were tasked with tackling the single largest challenge since the 1960’s – how will we care for ourselves and our communities right now and in the future? – and volunteering was acknowledged as one of the five high-impact solutions to address this very difficult question. Nominations are now open until Friday 12th April 2019. Tell us about volunteers, groups, a business or charity that has made an impact on your community and improved the lives of others. This is your opportunity to show just how much you appreciate them. Business Award:awarded to commercial organisations who have made an impact on their community. Individual Overcoming Adversity Award: awarded to individuals who have demonstrated outstanding commitment within their community either independently or through a charity/community group or through their employer, whilst overcoming personal adversity. Individual Volunteer – Young Person’s Award:awarded to a volunteer under 18 who have demonstrated outstanding commitment within their community. This may be something they have done independently or in connection with a charity or community / youth / school group or employer. Individual Volunteer – Adult 18+ Award: awarded to a volunteer aged 18+ who have demonstrated outstanding commitment within their community. This may be something they have done independently or in connection with a charity or community / youth / school group or employer. Individual Volunteer – With a Disability Award:awarded to a volunteer with a disability who has demonstrated outstanding commitment within their community either independently or through a charity/community group or through their employer. Innovation Award:awarded to social enterprises, commercial organisations and individuals of any age who have demonstrated innovation in developing a service / project to support the community. Voluntary Community Service Award:awarded to charities and community groups who are able to demonstrate outstanding service delivery to support their community and / or servicer users. Volunteer Team Award:awarded to a group of two or more volunteers of any age who have made an outstanding contribution to their community either independently or with a charity, community group or employer. Social Media Volunteer Award:awarded to a volunteer who has demonstrated outstanding commitment within their community through the use of social media. This may be something they have done independently or in connection with a social media group.